Before any significant progress can be made in altering textural characteristics of a meat product, the basic profile of the meat and the possible alterations in that profile due to processing procedures must be known. A number of papers have been published addressing ways to optimize the textural characteristics of broiler breast meat. Changes in broiler processing procedures and processing time lines have been adopted by processors because of the results of these studies. While the number of breeder hens processed annually is much lower than the number of broilers, adding value to the end product could result in new innovative product forms for this niche market meat. The traditional goal for heavy fowl processors has been to remove the muscles, dice or grind the meat and sell it as an ingredient in other products. In an effort to expand the product forms of breeder hen meat, which is usually assumed to be tough and chewy, this study was designed to profile the texture of the meat based on four postchill (PC) deboning times. 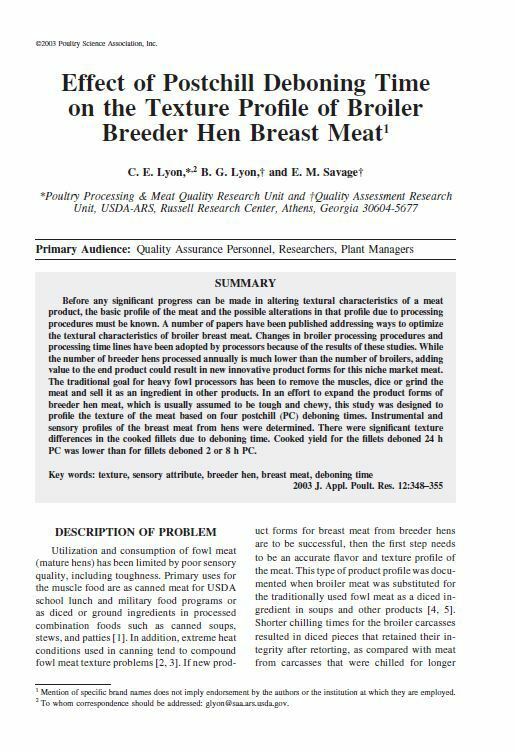 Instrumental and sensory profiles of the breast meat from hens were determined. There were significant texture differences in the cooked fillets due to deboning time. Cooked yield for the fillets deboned 24 h PC was lower than for fillets deboned 2 or 8 h PC.